Do you love the sleek look of vintage steel kitchen cabinets — but don’t want to undertake the rocky journey to find a set to fit your kitchen, then restore the cabinets, etc.? Well, that was reader Ann’s dilemma. 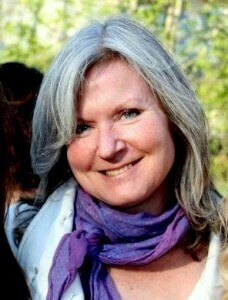 She recently purchased a 1965 condo apartment. The original kitchen was failing. 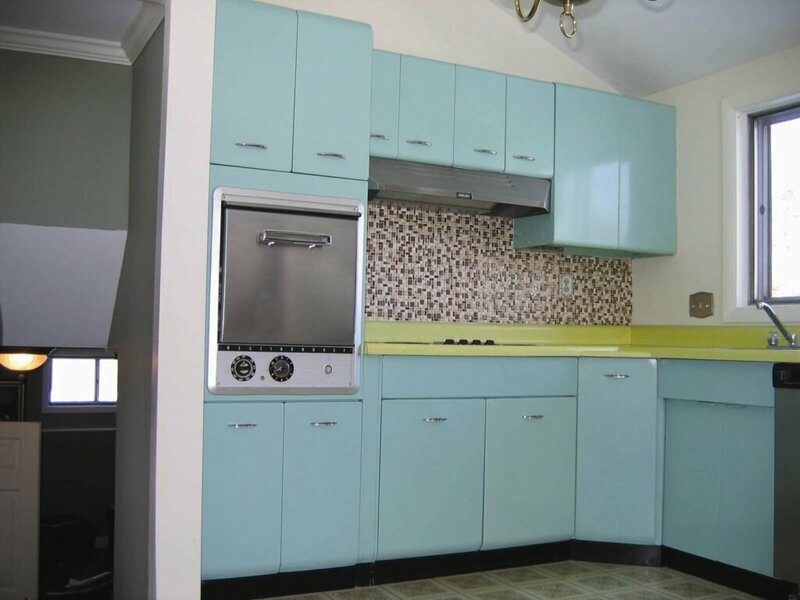 She loved the look of vintage, but did not want her kitchen to be an epic. So, instead of hunting down the vintage, she found a clever and patient cabinet maker who recreated the look of vintage steel to a tee using wood, and then finished them with special high gloss paint. Ann did use a New Old Stock vintage tile — both the floor and backsplash tiles are from World of Tile, of course. 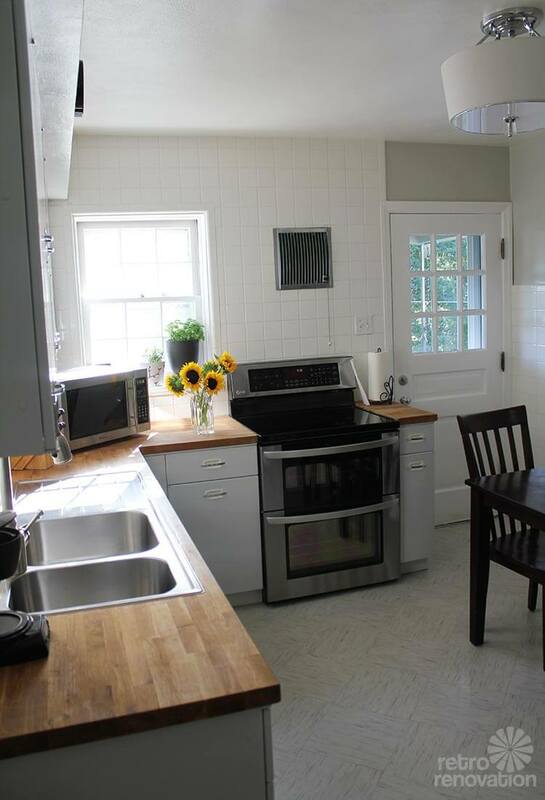 And there’s even another twist — Ann used a *famous* historic kitchen featured here as inspiration for her redesign. What a spectacular story — and kitchen. 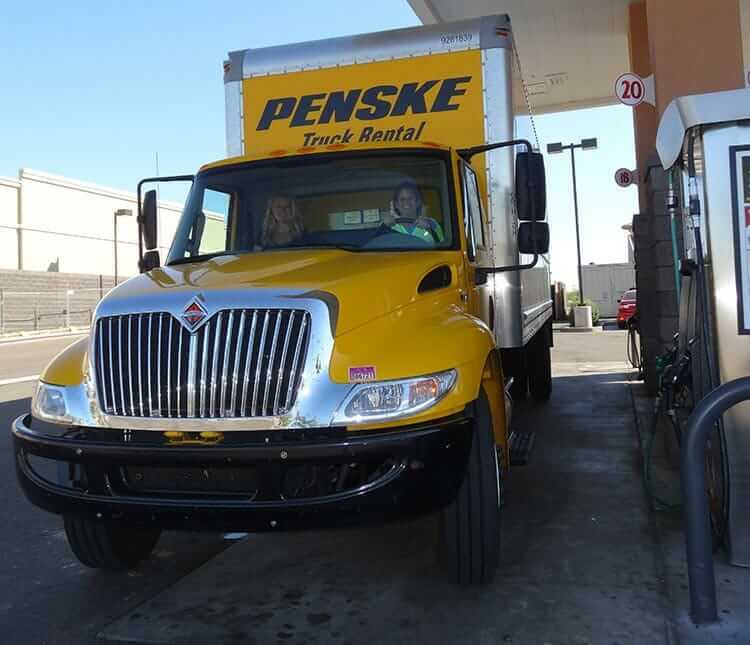 Read on for the complete story, more photos, and all of Ann’s resources. 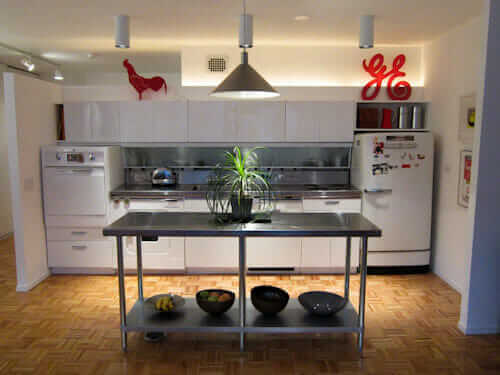 I didn’t have the time/resources to find a vintage steel kitchen, but wanted the look. So I found a custom cabinet maker here in Bucks County PA to create one in wood — Millworks LLC. Boy, did they come through! 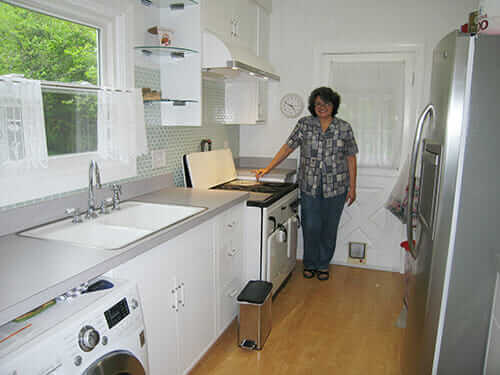 Ann’s design inspiration: The Koravos family kitchen — a “time capsule” kitchen salvaged for museum use. Photo courtesy of Historic New England. Used on this site with permission. My kitchen design is a replica of one I found through you — (the time capsule Koravos kitchen rescued by Preservation Massachusetts for historic purposes [shown above]. Millworks LLC researched every minute detail and with impeccable, high end, old world craftsmanship, delivered precisely what was requested. It occurred to me that a portion of your readership might be interested in doing this as well, especially with the resurgence of mid century architectural plans. Both the floor and backsplash tile came from World of Tile. I was dazzled by World of Tile, as I know you were too. It’s an amazing place. Can I offer some advice? I will anyway heehee. 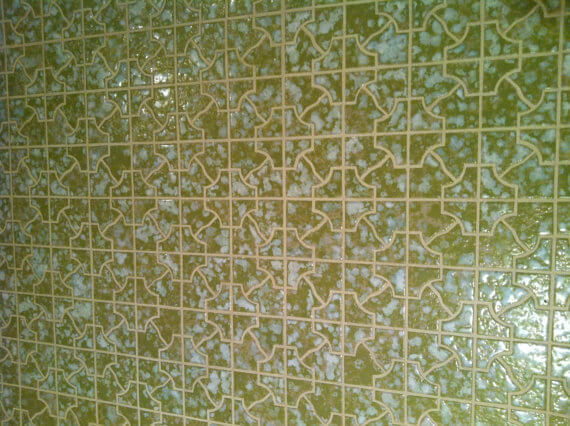 If you go with vintage tile, do yourself a HUGE favor and glue the sheets to new fiberglass mesh before you begin. The old mesh/paper/whatever-they-used will disintegrate when it hits the wet adhesive and you’ll be crying for the entire installation. It took us three weeks to lay the kitchen floor. If we had replaced the mesh it would’ve taken but a few days. It’s taken eight months to get to this point! My boyfriend Ron and I did most of the work ourselves. But it’s finally coming together. I was born with the retro in my DNA, and in my attic! My dad was a bomber pilot in WWII, and my Mom was a glamour girl. ALL Dad’s war gear and many of Mom’s best dresses, skirts, seamed stockings, hair rats etc were up in our attic. As a teen, I wore them to school. I also combed thrift shops back in the 70s and acquired an impressive collection of bubble dresses, swing jackets, clam diggers, you name it! 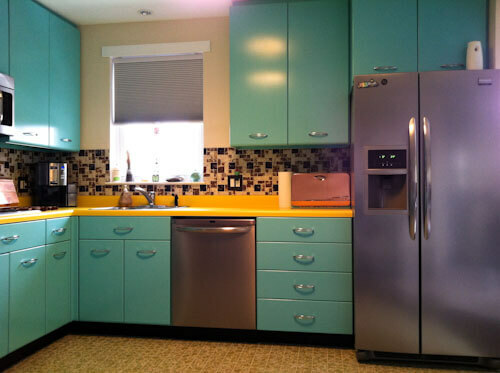 I loved anything and everything 40s, but 50s mid mod — hated it! It was a slow seduction that began with my sister sharing links to your photos of Time Capsule houses. Within those photos I began seeing styles that went far beyond kitschy diner. I began to collect pieces here and there, and found it went beautifully with my (then) obsession with Middle Eastern/West Indian decor. Finally, when I bought a 1965 Condo last year, my appreciation of mid-mod blossomed into love! The condo had its original kitchen and bath. I was prepared to love the kitchen, but it had a long, hard, sad life, and was unsalvageable. The kitchen had the much desired gold-flecked laminate counter tops, and I did my very best to save them. ( Alas, black mold infiltrating the substrate defeated me. 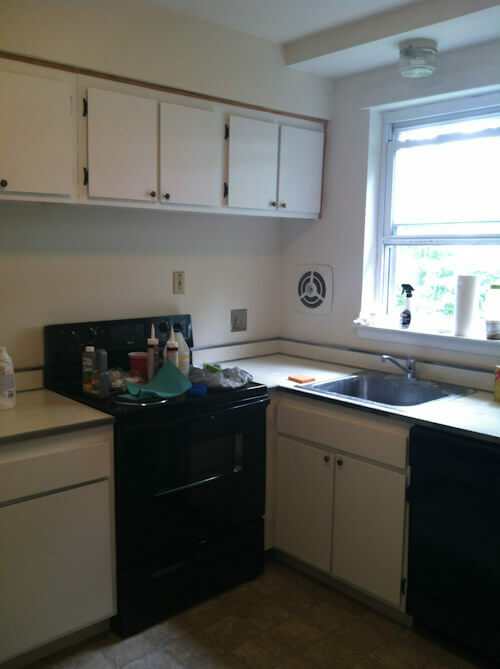 Badly neglected, cheap-to-begin-with cabinets also needed replacing. The bathroom, however, with its cast iron tub, console sink, and mud-set mosaic tile floor were saved. Yay! 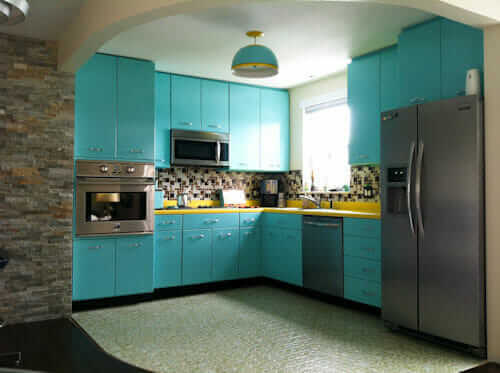 Now there’s a retro kitchen to match! Thanks so much for creating your website. Without it, I would never have found my dream kitchen!! Kitchen cabinets: Millwork LLC, Trubauersville, PA. The cabinets faces and doors are solid maple, and the boxes are lumber core veneer plywood, she says. Paint for the kitchen cabinets: Benjamin Moore Tropicana Cabana in a special catalyzed paint with a high gloss finish coat. Refrigerator, dishwasher and microwave: Frigidaire Gallery from H H Gregg. Oven: Brand new Kenmore Pro snagged on ebay for 1/4 the price. A closeout — picked up at a Sears in NJ. Stovetop: GE, gently used from Craigslist for 1/3 the price of new. Ann, there is not much more for me to say than: This is a really ingenious kitchen — you did an amazing job — and yes, when Ron gets his second wind and the back splash is finished, you know we’d love to see the finished kitchen. Thank you so much sharing! April! I’m so glad you’re hopeful and inspired by my story. How utterly cool to have the first home with central air! Wow! Your home deserves a knock out kitchen. Go for it! I never tire of gazing at mine. And thanks for living the bit about my parents. Such good memories! I wonder if you could give a bit more detail on the paint your cabinet maker used on the cabinets? I’m looking for a similar effect on a cabinet I’m building for my kitchen. I bought an oven and a separate cooktop on display close out, and I have a 44″ space where the original 1930s range stood. My intent is to build a cabinet to house my oven and cooktop that looks enough like a range of that era to fit in. I think a high gloss finish like you’ve done would look amazing. Any details you can provide would really help. Great job! 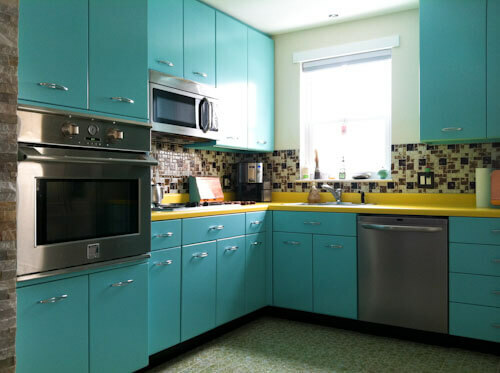 Love the color – I have an original birch veneer kitchen. I have painted all the fir boxes flat white and am refinishing the birch cupboard doors and drawers and reinstalling the original round copper concave pulls. Rather than refinish the inside of the doors as well I have painted them turquoise – that color makes me so happy! I want to know what special catalyzed paint to look for and what was used for the high gloss finish coat?